Vilhelm's Set is an Armor in Dark Souls 3. It is part of the Ashes of Ariandel DLC. The black (piece name) of Vilhelm, Knight of Londor, and a nice fit for any lean Hollow. This hollow knight, who served the three sisters who founded the Sable Church, was particularly loyal to the eldest, and was known as a cold-blooded hangman. Painted World of Ariandel: Sir Vilhelm, Knight of Londor's armor. His armor can be found in the crypt filled with bugs where you turn the crank handle to enable the Sister Friede boss fight. The ID of Vilhelm's Set once belonged to the Burial Knight Set, an armor set that was cut from the game. The IRL historical inspiration of it. No wonder I am so attached to this beautiful armor set, LOL. Herald legs, Brass gauntlets, Vilhelm&apos;s Armor, Pyromancer Crown, Holy Sword of Lothric (sword beams yo), Golden Wing Crest/Shield of want = Link cosplay. Vilhelm has a small head. Remind anyone of the Fallen knight set, albiet better taken care of? Since the armor doesn&apos;t offer terrific physical defense, I swap the leggings and gauntlets for Ruin set stuff. The gold color works well with the subtle gilding on the helmet, and the striped pattern works well with the shawl. But the helmet is also fun to use with bulky armor to give you that shrunken head look. Vilhelm&apos;s leggings, armor, & gauntlets + billed mask= Cainhurst set cosplay. To me, a slim armor set like this is somehow more fitting for girls. Vilhelm has a tiny head. 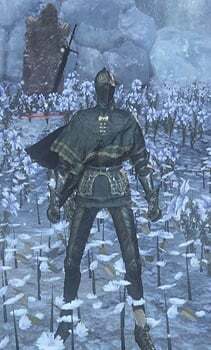 I don&apos;t know if you know it yet, but if you wear this armor and you die in the first phase of the boss fight with sister friede, friede will tell you another things instead the normality!!! GUYS I HAVE FOUND A SECRET IN THIS AMOR!! IF YOU TRY TO KILL THE SISTER AT THE FIRST "STEP" AND YOU DIE, SHE WILL TELL YOU ANOTHER THINGS INSTEAD OF THE NORMAL DEAD WITH ANOTHER ARMOR!!! On its own it looks kinda meh, but take Yuria&apos;s armor and replace the dress with Vilhelm&apos;s armor and there you have Knight of Londor cosplay (or Lord of Hollows who doesn&apos;t wear dresses). Looks better too. 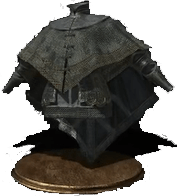 The poncho part of the chest armor looks a lot like the Tattered Cloth Robe from Dark Souls 1. But that robe is stated to be from the Great Swamp (and is starting gear for the Pyromancer). Vilhelm is a knight of Londor, true, but could he also have connections to the Great Swamp? We know Vilhelm must have at least some pyromancer stats, given the dark pyromancy nature of his sword. So who knows, maybe Vilhelm passed through the Great Swamp at some point, or at least picked up some fashion tips from a pyromancer. I can easily say that my character&apos;s head is in a lot of pain with this helm.